Chives can be found in the produce section of most health food stores, specialty markets, and supermarkets. They’re also available dried, but the fresh variety is far preferable. Look for those with a uniform, glossy appearance and bright green color, with no signs of browning. 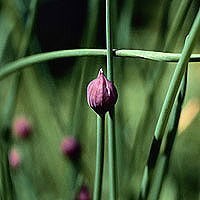 Chives are a type of onion.